Bluey and Dusty are best friends heading off to fight in the Great War as ANZACs and members of the Australian Light Horse. They travel together to Egypt for training (Dusty feels seasick on the way) and then they board another ship to take them to the battlefields in Gallipoli. The fight side-by-side and encourage each other through the hardships of the war until they were separated by injury. When the war is over Bluey and Dusty returned home. They have changed in many ways, but they are still good friends. 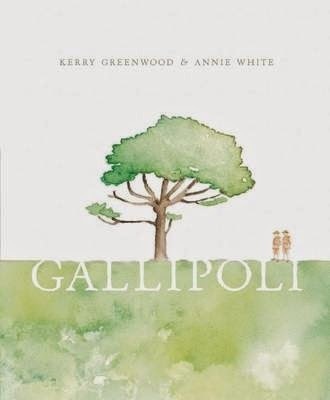 Written by Kerry Greenwood, well known for her Phryne Fisher detective adult fiction series, Gallipoli emphasises the value of friendship, loyalty and humour for the soldiers during World War I as they faced the challenges of the battlefield. The story touches on the dangers and hardships experienced by the soldiers, including injury and death on the battlefield, but there is a lightness about the illustrations by Annie White and an emphasis on the friendship and camaraderie of Bluey and Dusty that ensures this story isn’t too confronting for younger readers. The story particularly focuses on the battlefield at Gallipoli, mentioning Simpson and his donkey, a brief truce and exchange of gifts with the Turkish soldiers, and the clever modifications to the rifles that enabled the soldiers to retreat safely from the battlefield when the orders were given to evacuate. Gallipoli is a lovely tribute to the courage, loyalty and mateship that are such a significant part of the Anzac legend.